HALIFAX, Nova Scotia A former Canadian Navy intelligence officer who pleaded guilty to espionage on Wednesday was selling secrets to the Russians for about $3,000 a month. Federal prosecutor Lyne Decarie outlined the case against Delisle during a bail hearing in March, saying he voluntarily entered the Russian embassy in Ottawa in 2007 and offered to sell information to them. A publication ban was imposed on those hearings at the time. At the bail hearing, Decarie read portions of a police statement where Delisle reportedly described the day he walked into the embassy as "professional suicide." "The day I flipped sides ... from that day on, that was the end of my days as Jeff Delisle," Decarie read from his statement. She said he claimed to police that his betrayal "was for ideological reasons" and that he wasn't doing it for the money." Delisle, 41, worked at a naval communications and intelligence center in Halifax that was a multinational base with access to secret data from NATO countries. Decarie alleged in court that Delisle had access to the facility's secure and unsecured systems that contained information from Canada and allies, and that he shared mostly military data. Decarie said Delisle was asked to search for Russian references in the past month on his work computer, then copy it onto a USB key and take it home with him where he uploaded it to an email program that he shared with his foreign handler. Decarie said Delisle, a father who is divorced from his first wife, received $5,000 for the first couple transfers and then $3,000 every month. Decarie said he began doing it "following some personal problem." He came to the authorities' attention when he was returning from a trip to Brazil to meet a Russian handler in the fall of 2011, Decarie said. He was carrying several thousand dollars after staying the country only four days, raising the suspicions of Canada Border Services agents who shared their concerns with the police and military. The prosecution said some time after, the Royal Canadian Mounted Police took over the account he shared with the Russians, allowing him to think he was transmitting material to a Russian agent when "it was actually the RCMP opening the email." Delisle was arrested in Halifax last Jan. 13 and charged with espionage and breach of trust, making him the first person in Canada to be convicted under the country's Security of Information Act which was passed by Parliament after the terrorist attacks on the United States on Sept. 11, 2001. Defense lawyer Mike Taylor said the evidence against his client is overwhelming. "You reach a point in which you say, 'OK we're toast,'" Taylor said in a telephone interview with The Associated Press. "Barring some catastrophic happening there was going to be a conviction." Taylor said at no time did his client put any Canadian troops in danger. "There was no information that indicated where troops were or ships were," he said. Taylor also suggested the Russians put pressure on when at one point he tried to stop spying. Decarie said Delisle told officers that the Russians had pictures of his children. "They had all my information. They had photos of me," Decarie read from the statement. "They had photos of my children and I knew exactly what it was for." 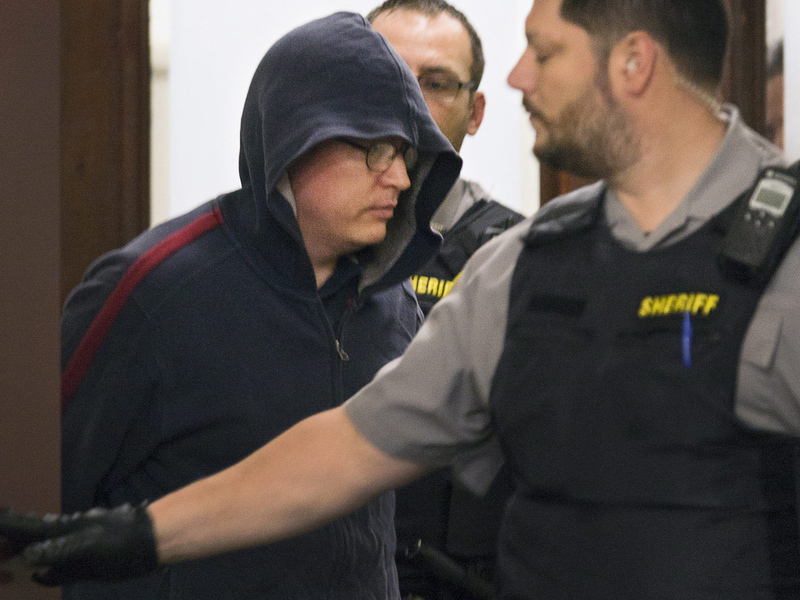 Delisle, wearing a blue hooded sweat shirt, jeans and glasses, clasped his hands and appeared unmoved as the judge asked him if he understood the consequences of the plea on Wednesday. Taylor said no deal on sentencing was reached with the prosecution. Delisle is looking at life in prison, but Taylor said it will be up to the judge. Two days of sentencing hearings will start Jan. 10. The Canadian military, the government and police have not revealed any details about what information is alleged to have been disclosed. A spokesman for Canada's defense minister said they'll reserve comment as the judicial process continues. Delisle, who joined the navy as a reservist in 1996, became a member of the regular forces in 2001 and was promoted to an officer rank in 2008. He had access to systems with information shared by the Five Eyes community that includes Canada, the United States, Britain, Australia and New Zealand. In damage assessments read in court, officials in the Canadian intelligence community said the breaches from 2007 to 2012 could unmask intelligence sources and place a chill on the sharing of vital security information among allies. "Delisle's unauthorized disclosure to the Russians since 2007 has caused severe and irreparable damage to Canadian interests," one official wrote in a statement read by Decarie.